With table space for your book or snacks, you and your honey won't need to leave this seat all day. This High Back Heart Glider Double Seater Tete-A-Tete set is Amish handcrafted from solid pine wood. This two seater Tete-A-Tete is the perfect spot to enjoy a bottle of wine together under the stars as well. 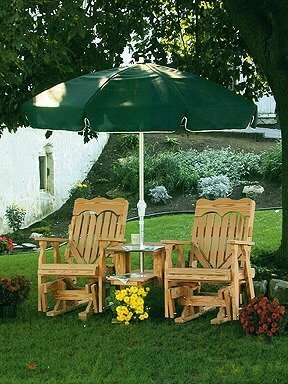 This outdoor furniture makes a great anniversary gift or birthday gift.